Not to be confused with the US detective comedy drama. 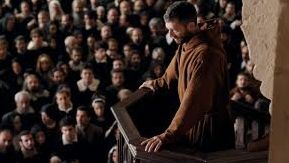 This French cautionary tale is based on a 1796 gothic novel about devout Capucin Ambrosio’s (Vincent Cassel)’s fall from grace. After offering succour to a strange, masked pilgrim, Ambrosio gets bitten by an insect in his rose garden – you can probably sense a metaphor brewing here – and the succour’s soon feverishly returned. Director Dominik Moll makes some odd style choices – like Looney Tunes -style ‘iris wipes’ – and it’s a while before Cassel fully embraces his dark side, yet his customary charisma is what seals The Monk ’s redemption.